Looking for Gold in the Valley? 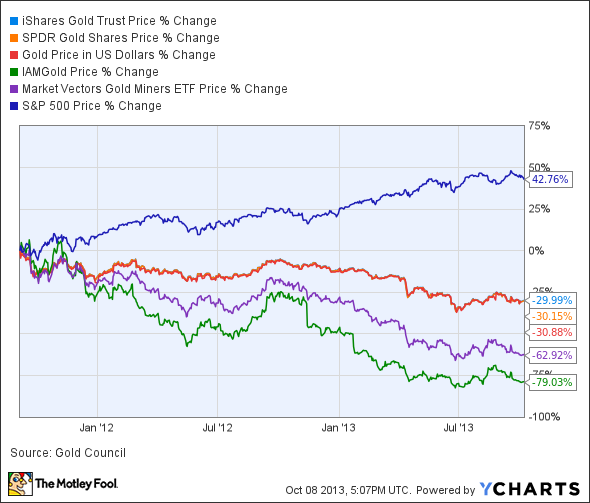 Gold is down 25% from 2011's highs, and gold miners are faring much worse. Is this a buying opportunity? The strong performance of the market following the "Great Recession" has left gold in the dust as investors fled the perceived safety of gold to get in on a recovering equity market. So here we are today, with the market still near all-time highs, and plenty of uncertainty to go around. Is this shades of 2008, or is it really different this time? Let's take a closer look. Gold mining is one hard, dirty business, challenged by much more than just the price of gold. Gold mines are located in extremely remote places, almost always without any underlying electric grid for miners to utilize. 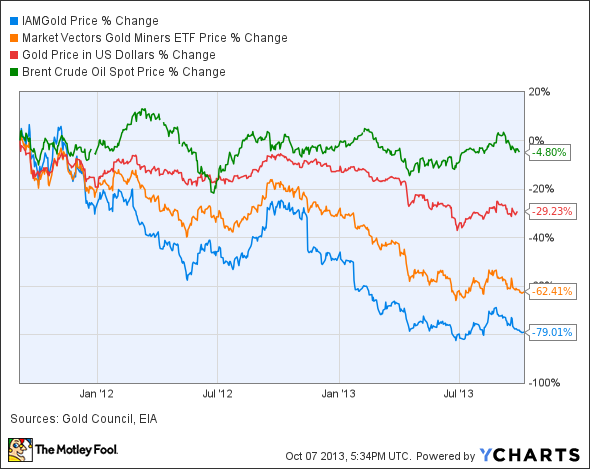 And as you can see above, oil prices are relatively flat since September 2011, while gold has fallen nearly one-third. Simply put, this isn't a good combination for growing profits. And most importantly, don't read too much into what's going on with things like the government shutdown, or the talk about interest rates increasing, and automatically assume that these things will lead to a recovery in the price of gold, helping to lift miners back up as the gap between energy costs and gold prices narrows. 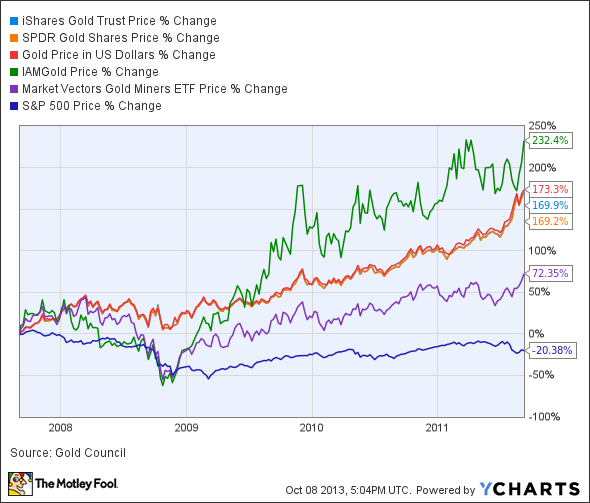 Gold prices are largely a product of investor speculation. Back in 2007, the economy was on the doorstep of the worst event since the Great Depression. This created a perfect storm of sorts that sent investors flocking to gold in droves over the next few years. However, as the market and economy recovered, leading us to where we are today, it truly is a different situation. There's little reason to predict a global economic meltdown happening in the near term. While far from perfect, the domestic and global economy is in a much more stable place today, specifically the financial markets that devastated the economy. As I mentioned above, much of the price of gold is based on investor speculation. Without the massive uncertainty that the Great Recession caused, there's just no reliable way to draw a line between gold being down, the stock market being up, and expect it to cross over market-beating returns in gold, or gold miners for the foreseeable future, especially with input costs like gas and oil predicted to remain high for the foreseeable future.